TotalSim can help with all your marine and offshore CFD requirements, applying cutting edge CFD to a vast range of applications. TotalSim are at the forefront of CFD development and application, using cutting edge methods and opensource codes to push the boundaries of CFD. With a background in Formula 1 you can be assured our CFD methods are advanced, efficient and effective. CFD can provide a cost effective and accurate alternative to tank and wind tunnel testing for marine vessels. CFD simulation of a sailing yacht by TotalSim. CFD simulations can be carried out early in the design cycle, before manufacturing has commenced, ensuring effective designs straight out of the box and reducing product design costs. TotalSim can analyse the hydrodynamic forces on hull forms and any submerged surfaces as well as providing detailed aerodynamic analysis of any surfaces above the waterline. TotalSim can also perform optimisation of hull forms, submerged appendages, propellers and other submerged structures. 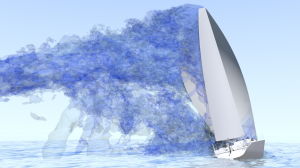 Please follow the links on the left for more details on our Marine CFD services in predicting hydrodynamic forces, marine aerodynamics, optimisation of marine structures and offshore CFD applications.